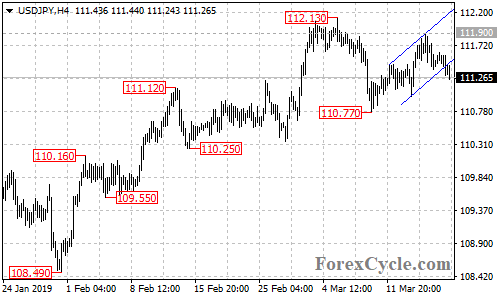 USDJPY broke below the bottom support trend line of the price channel on the 4-hour chart, suggesting that the short term uptrend from 110.77 had completed at 111.90 already. Deeper decline to test 110.77 support is possible in the coming days. Resistance is at 111.65, above this level could trigger another rise towards 112.00.